"Birds Eye View of Philadelphia," 1875. The hustle and bustle of human activity-the freewheeling bravado of lumbering stevedores, transient immigrants with foreign tongues and habits, and platoons of Union soldiers headed for the warfront-gave to Philadelphia's dockside neighborhoods a distinctive ambience after the Civil War. Sights and sounds of humanity on the move along the boulevards and piers of South Philadelphia bespoke a city on the move. Although New York already had surpassed Philadelphia as America's largest city and chief port of entry, the so-called Quaker City was still America's second-largest city, a thriving industrial center, and a vital force in the American economy. The city also remained major transportation hub and gateway to America and Pennsylvania's industrial empire. 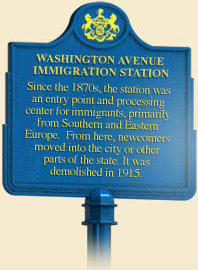 The Washington Avenue Immigration Station, which operated between 1873 and 1915, was the final entry point for an estimated 1 million immigrants who left Europe for the promise of a new life in industrial America. 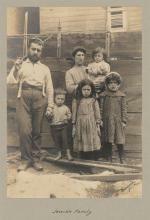 Though only a fraction-no more than 5 percent-of the people who immigrated to the United States during those years, the newcomers who entered through Philadelphia represented every ethnic and religious group that comprised America's so-called "New Immigrants" who arrived between the 1880s and the outbreak of the First World War. Where Philadelphia's Lazaretto Station had begun its life in 1799 as a municipal quarantine facility to combat the spread of contagious diseases, the Washington Avenue Station had a far more commercial origin. In what proved to be a shrewd business decision, managers of the Pennsylvania Railroad opened the Washington Avenue Station in 1873 to augment their expanding control of Mid-Atlantic freight and passenger rail service. In the aftermath of the American Civil War, the railroad sought to incorporate related enterprises into its business activities, to increase its profits and better control its destiny. In the case of the Pennsylvania Railroad, expanding into the trans-Atlantic passenger market made complete business sense. Once trans-Atlantic passengers cleared health inspection at Lazaretto, their ships proceeded up the Delaware River to a dock adjacent to Washington Avenue. There, customs agents and employees of the railroad ushered newcomers through a final inspection before proceeding to a ticket counter in a large lobby. The Washington Avenue Station was never as large as New York's Castle Garden or Ellis Island, but it was a well-organized operation. Its lower level included a money exchange, comfort stations that offered a chance to clean up, and ticket booths for destinations along the Pennsylvania Railroad routes. Between the 1870s and 1915, several passenger liners operated between Philadelphia and European destinations. The largest and most profitable was the American Line (1871-1902), which the Pennsylvania Railroad founded in 1871 and then soon sold. With weekly service between Philadelphia and Liverpool, England, via a stopover in Queenstown (Cobh), Ireland, the American Line was at one time the largest American company in the competitive trans-Atlantic market. Its ships, including the Kensington, Southward, Haverford, and Merion, each bore a Philadelphia area place-name. By the late 1890s, the German-owned Hamburg-America Line was the America Line's chief foreign competitor at the port of Philadelphia. Ships from Holland, northern Germany, and England also vied for their share of the Philadelphia market. On the eve of the First World War, Philadelphia received on average 50,000 passengers a year at the Washington Avenue Station. All told, between 1910 and 1914, a quarter-million people passed through the station, before the outbreak of World War I drastically reduced passenger numbers. But who were the people who entered America through South Philadelphia's dockside immigration station? Much like other immigration stations along the Atlantic seaboard, Washington Avenue Station's passenger lists reflected national trends in immigration. During its first two decades of operation, from 1873 until 1896, when the railroad company completed an expensive modernization of the facility, the vast majority of arrivals came from Western and Northern Europe. Irish, Welsh, and English travelers accompanied larger numbers of people from Germany. By 1896, however, Southern- and Eastern-European immigrants far outnumbered the so-called "Old Immigrants" who had been predominant since the 1700s. This meant large numbers of Italians, Poles, ethnic Hungarians (Magyars), Jews, Russians, and others. Postcard of The Merion, circa 1906. Some of these newcomers remained in Philadelphia, where they settled in the city's industrial rowhouse neighborhoods adjoining older settlements of Irish, English, Germans, and African Americans. Although its rate of growth had slowed compared to newer industrial cities like Chicago and Pittsburgh, between 1890 and 1915, Philadelphia's population more than doubled to more than 1 million residents, and reached close to 1,824,000 by 1920. Others moved on to cities, milltowns, and coal towns through the Commonwealth and the mid-Atlantic region, including Bethlehem, Johnstown, Pittsburgh , and Shenandoah. Although eclipsed by the larger and more prominent federal government station at Ellis Island in New York Harbor, Philadelphia's Washington Avenue Station continued to operate until the First World War, when a precipitous decline in trans-Atlantic passenger service spelled the doom of the once vibrant station. The facility that had handled more than 50,000 immigrants a year was torn down in 1915 as the international crisis made its continued operation unnecessary. Once called "the most colorful place in Philadelphia," the riverside Washington Avenue Immigration Station ceded its role in welcoming America's "huddled masses" to the federal government and Ellis Island to its north. John Bodnar, ed., The Ethnic Experience in Pennsylvania (Lewisburg: Bucknell University Press), 1973.